The skull is highly integrated and highly modular, but can the skull itself be viewed as a module? And what would the conceptual consequences be if it proves to be the case? 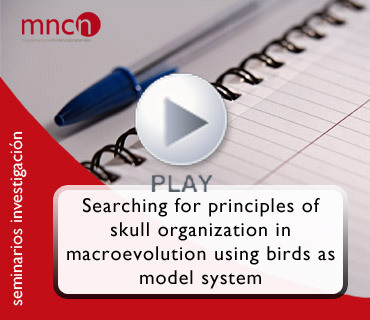 I will show a suite of results from our year-long research program in avian skull variation with which we envision a future prospect to aim at both disentangling further the organizing principles of skull morphology in vertebrate macroevolution and to conceptually interpret its evolutionary significance. Presentación: David Buckley, investigador contratado JAE-DOC del Departamento de Ecología Evolutiva, Museo Nacional de Ciencias Naturales, CSIC. Ponente: Jesús Marugán-Lobón, Universidad Autónoma de Madrid (UAM).